Infrared thermography is a useful tool to locate roof leaks and damaged roof deck on commercial buildings. Thermal imaging can locate water penetration on flat and low sloped roofs and help avoid roof replacement. 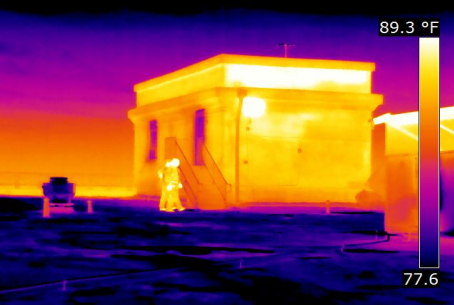 We use Infrared Cameras to detect small differences in temperature of the roof deck because of the moisture under the roof covering. 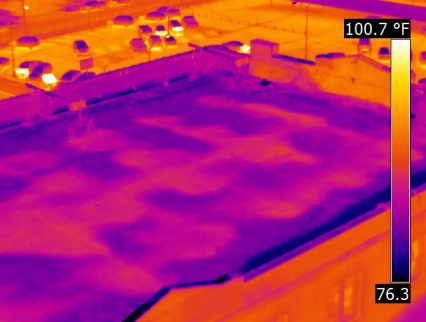 The Infrared Roof scan or survey is performed at night and as the roof gives it heat off to the sky, the moisture retains its heat longer and the temperature difference clearly indicates all wet areas. Greg Stockton is one of the top Infrared Thermographers in the industry and has written a paper on Infrared Roof Scans that can explain the value of this services. A Closer Look will use an expensive high resolution infrared camera to document moisture. 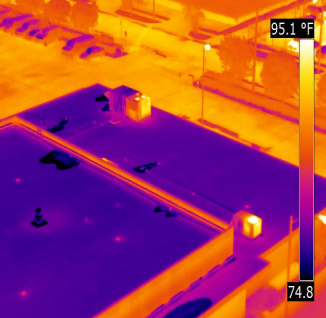 As your roofing infrared Thermal imaging leaking roof thermographer, we can locate roof leaks in the DFW, Dallas and Fort Worth area on your commercial buildings. Thermal imaging is proven to lower the cost of roof repairs and roof replacement in the DFW area. Our inexpensive infrared scanning service can locate the problem areas that can then be submitted to roof repair companies for bids. A Closer Look Inspection Service provides DFW, Fort Worth or Dallas thermal imaging services to help you control your facility cost. Roof replacement may necessitate upgrading your roof insulation to continuous R-20 insulation at the roof deck. Insulation increases the energy efficiency and will lower utility cost, but it is a large investment during a challenging economic time. Our certified thermographers use infrared cameras as a tool to help detect moisture that has leaked through and under the roof membrane. These wet areas are also very energy inefficient because on the conductive moisture. DFW thermal imaging is here to save you money using technology and knowledge.